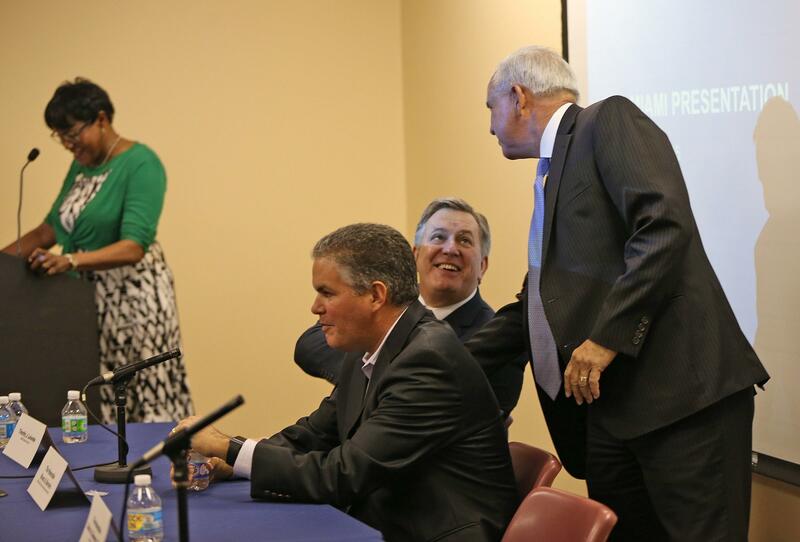 Timothy Leiweke of Miami Beckham United shakes hands with Miami-Dade Mayor Carlos Gimenez as the David Beckham group and Miami-Dade officials held a town hall meeting on plans for a stadium in Overtown on Thursday December 17, 2015. Some residents from Overtown and the neighboring community of Spring Garden were also on hand. The feeling from Overtown residents resonated a skeptic tone. Pastor William Williams said, "We have seen a lot of smokescreen that has come through this community in the name of progress." He was referring to past promises made to Overtown residents who were looking for economic growth and job opportunities. The plan is for the Beckham group to purchase land over two blocks at the corner of Northwest Sixth Avenue and Northwest Eighth Street. The stadium will seat 25,000 and have a partial roof. Some of the land is owned by Miami-Dade County, which means it can be purchased without a bidding process. But, under the economic-development law, there is a package of hiring requirements. Some residents from Spring Garden, an adjacent community, were not happy about the stadium being that close to their homes. This is part of the area of Overtown along Sixth Avenue and Seventh Street where the Beckham Group plans to build the new stadium. Doug Hanks of the Miami Herald was there. He said Spring Garden residents were worried about property value. He said one resident said, "I've got this boathouse on my waterfront property and the stadium's gonna cast a shadow on it." Hanks also mentioned that Beckham's group was starting a "hotline to deal with Beckham stadium rumors that people could call." "That was pretty unusual to me," Hanks said. "That surprised me." Miami-Dade Mayor Carlos Gimenez was in attendance as was Audrey Edmonson, the county commissioner whose district includes Overtown. He said there must still be some zoning changes. Miami will also have to close a one-block stretch of Seventh Street to accommodate the stadium. The chance of Miami getting a Major League Soccer team may depend on a couple of landowners. David Beckham's group, Miami Beckham United, has been trying to solidify a location for a new soccer stadium in order to bring a professional team to the city. Potential sites along the water in downtown to Sun Life Stadium to Florida International University have been floated. The one that has the best chance, and the one the group is pushing for, is the one next to Marlins Park. It was almost a year ago when international soccer star David Beckham stood before a crowd of Miami leaders and fans to announce he chose Miami as the home to his new expansion franchise for Major League Soccer.